There are two Michigan Department of Natural Resources (DNR) public access sites on the lake, along with several marinas. 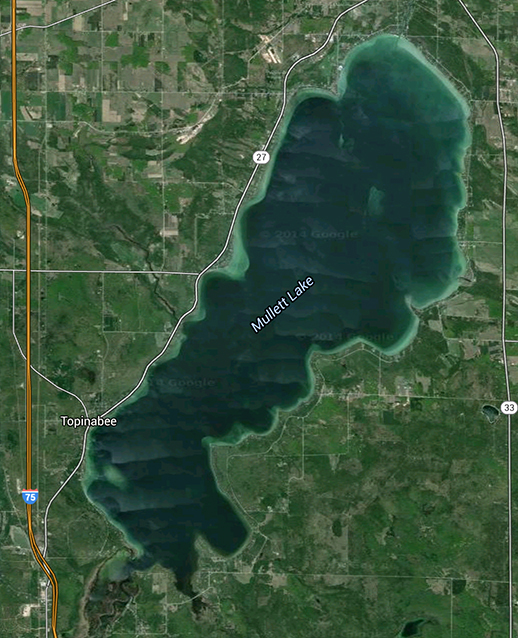 Mullett Lake is a large, deep, high-quality lake with 200 billion gallons within its basin. It is part of northeast Michigan’s Inland Waterway and is the state’s fifth largest lake, with a surface area of 16,630 acres. Tributaries of Mullett Lake include: Indian River, Little Sturgeon, Mullet Creek and East Little Pigeon. Mullett Lake lies within six different townships: Aloha, Benton, Inverness, Koehler, Mullett, and Tuscarora. Mullett Lake is a popular lake for recreationists and supports activities such as fishing, boating, kayaking, canoeing, and swimming. During the summer months, the local population can increase three-fold with tourists and seasonal residents. Mullett Lake is monitored every three years through the Watershed Council’s Comprehensive Water Quality Monitoring (CWQM) Program for dissolved oxygen, specific conductivity, pH, nitrate-nitrogen, total nitrogen, total phosphorus, and chloride levels. Water transparency, chlorophyll-a, and water temperature are also monitored in Mullett Lake each summer by volunteers as part of the Watershed Council’s Volunteer Lake Monitoring (VLM) Program. See additional resources on our ﻿Aquavist page﻿.